Welcome to the first day of the Lisette Portfolio Dress Sew Along with Gwenny Penny and Pickup Some Creativity! I’m so excited to be collaborating with Chris on this project. 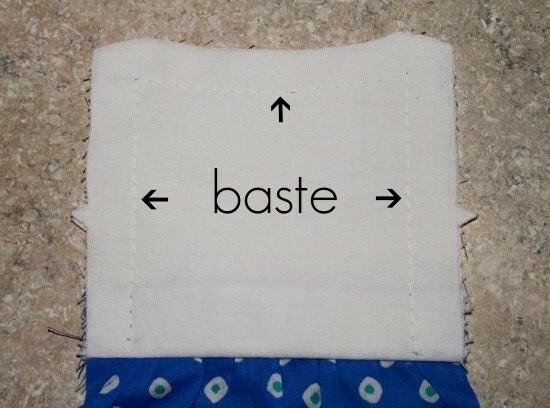 Our sew along was even mentioned on the Lisette blog! How cool is that?!? If you follow along with us, you will have a Portfolio Dress by the end of the week. We have a Flickr group set up so you can share your dresses with everyone. If you fall behind or don’t have time to keep up, don’t worry. We are going to wait until next Friday, May 6th to feature people’s dresses. This will give you some extra time to finish up. If you are playing along and haven't grabbed a button yet, you can find the code in my sidebar. To start things off today, hop on over to Chris’s blog for tips on laying out your pattern pieces and cutting your fabric. 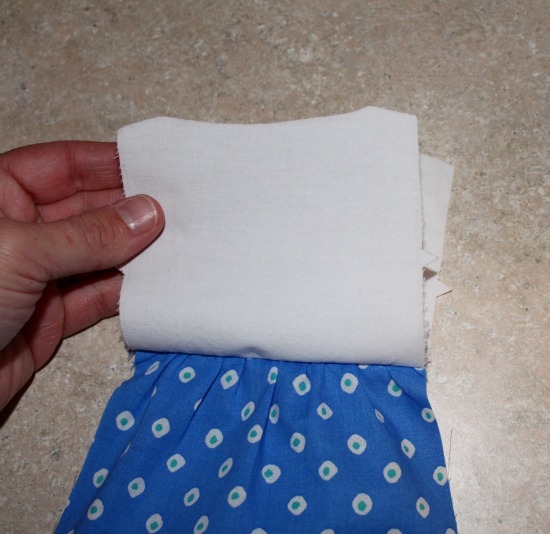 Then come back over here for Steps 1 through 5 of the pattern sewing directions. We are providing guidance for View A of the pattern. 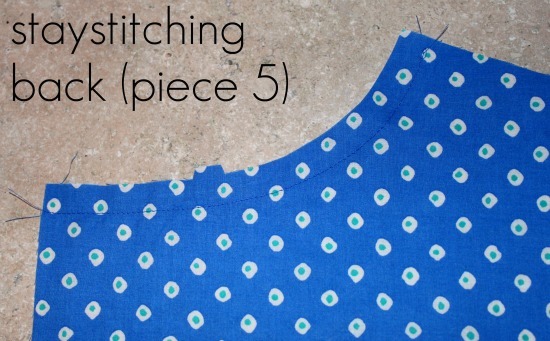 Stitch 5/8" seams unless otherwise noted in the pattern sewing directions. Make sure you match up notches when pinning your pieces together. Press seams open unless otherwise noted in the sewing directions. Trim seams to reduce bulk, clipping corners and curves when necessary. Staystitching prevents the fabric from stretching out of shape during construction. It also helps support the grain of the fabric at the seam line. The most important seam lines to staystitch are curves or angles. 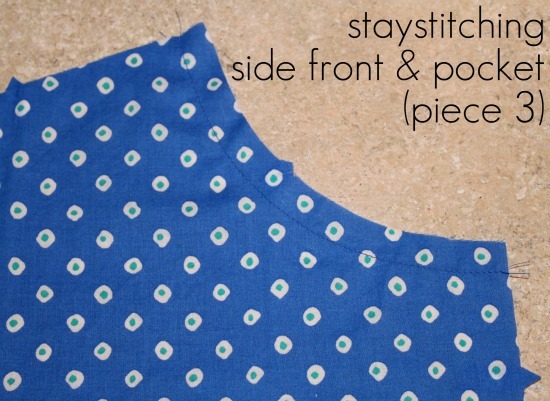 Staystitching is done through a single layer of fabric about 1/8" from the seam line, which is why for this dress you are staystitching about 1/2" from the edge of your fabric. Use a regular stitch length and matching thread. This stitching is within the seam allowance and will not show on your finished garment. Following the arrows in the illustration in Step 1 of your sewing directions, you will staystitch 4 pieces of fabric because you have two of piece 3 and two of piece 5. Note that the illustration shows the pieces with right sides facing up. For each piece, start at the top of the neckline by the shoulder and sew your staystitching around the curve toward the center of the neckline. 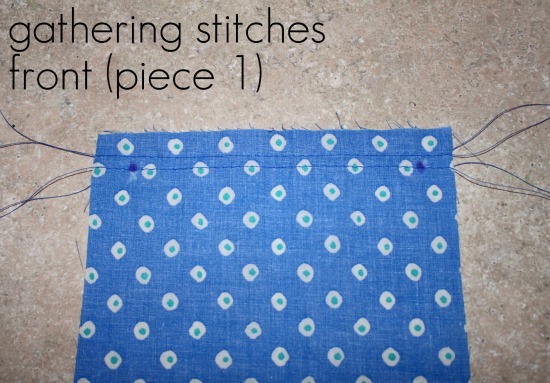 To create the gather along the top of piece 1, you need to use the longest stitch possible on your machine. Do not backstitch when sewing. Leave long tails of thread on both ends of your stitching. 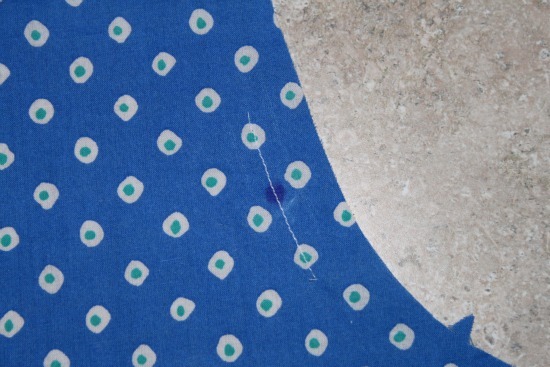 Sew one line of stitches between the small dots along the seam line (5/8" from the edge of your fabric). Sew a second line of stitches 1/4" from the first line of stitches, within the seam allowance. Don’t gather up the fabric yet. We’ll do that in the next step. You have two pieces of piece 2 cut out. Choose one to apply your fusible web to. This will be your front yoke. The other piece 2 will be your front yoke facing for the inside of your garment. Once you apply the fusible web to the front yoke, line up the small dots on this piece with the small dots on the front (piece 1). This will require you to gather up the fabric on piece 1. Place the front (piece 1) right side up. Place the yoke (piece 2) wrong side up (i.e. interfacing up). 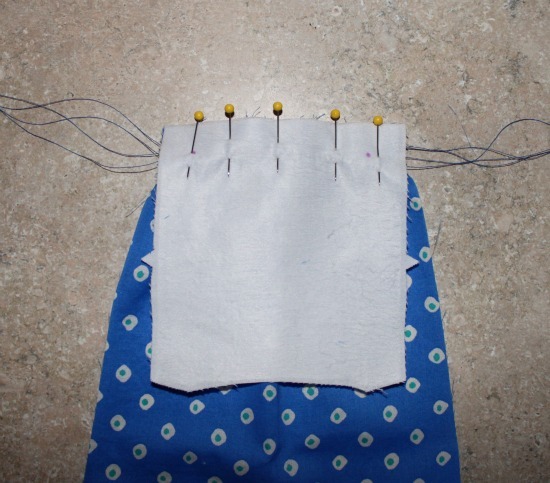 Pull the bobbin thread tail on each row of gathering stitches on piece 1, adjusting the fullness of the gathering by spreading the gathers so that they are evenly spaced across the width of the piece. 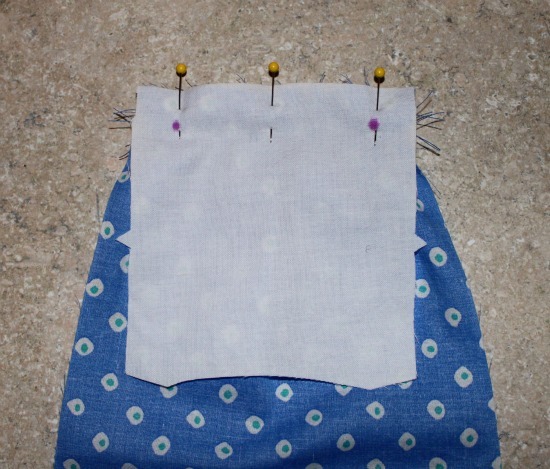 Once the small dots on piece 1 line up with the small dots on piece 2, you have gathered the fabric to the proper width. Pin the two pieces together. Your raw edges should be even. 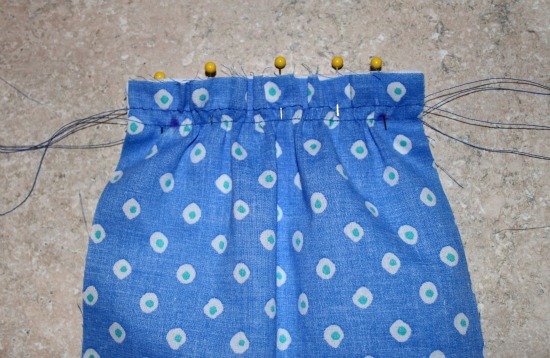 To baste the two pieces together, sew along the bottom row of gathering stitches (seam line), continuing to use a long stitch length. Before we continue, I want to note that the pattern illustration for Step 3 is incorrect for this next part. Take your front (piece 1) and flip it over so it is wrong side up. Take your front yoke facing (other piece 2) and pin it right side down on piece 1, lining up the small dots. Your raw edges should be even. 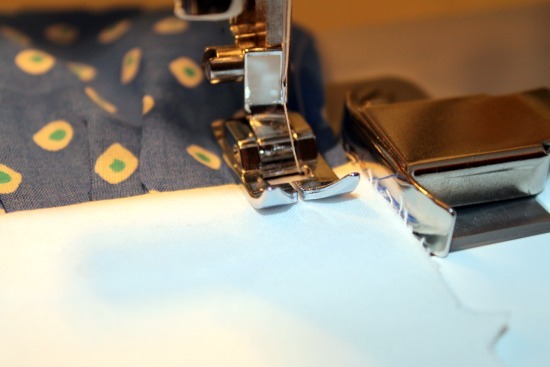 Change your machine back to your regular stitch length. Sew along the seam line (5/8" from the raw edges). Take your two yoke pieces and pull them up so that they are back to back, making sure that the notches match up. Press as directed in Step 4. To baste, change your machine back to a long stitch length (change thread color if necessary), and baste the two yoke pieces together along the seam line (5/8") around the left, top, and right sides. Change your machine back to your regular stitch length (change thread color if necessary… which I forgot to do :). Sew from 1" above the large dot, through the large dot, to 1" below the large dot at 5/8" from the raw edge. Repeat for the large dot on the opposite side. 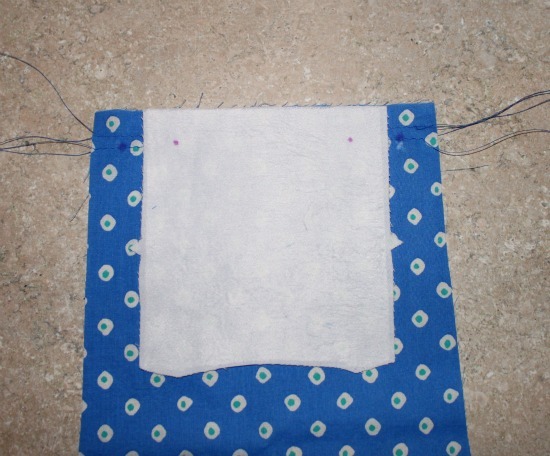 This is to reinforce the pocket area of the garment. That’s all for today! Come back tomorrow for Steps 6-10 (and some tips on finishing seams) on Pickup Some Creativity and Steps 13-16 here on Gwenny Penny (in case you’re wondering, Steps 11 and 12 don’t apply to the dress pattern). If you have any questions, tips, or comments, please leave them in the comments section below so that everyone can benefit from the discussion. Thanks for sewing along! Excellent Gwen!! getting to work right now. Holy schmoly- I better get some fabric!